NEW YORK –- Every time he has a big game, or a big moment, it’s only natural to wonder if Derrick Rose, somehow, is on the way back to being the player he was before all the injuries. The player who was named NBA MVP at age 22. The player who led the Chicago Bulls to the Eastern Conference finals in 2011. The player who was Russell Westbrook before Russell Westbrook. 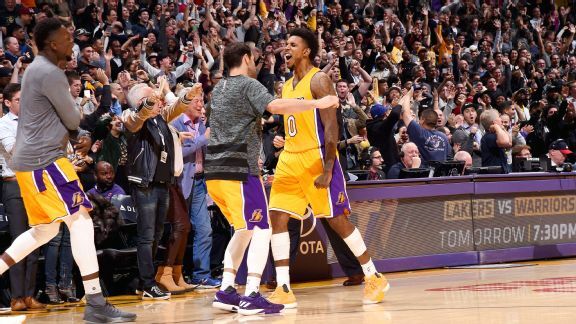 Swaggy P saves the day in Lakerland to headline Tuesday night's best from the NBA. No one’s questioning whether Rose can still play, certainly not after what he showed on Tuesday night. Rose had 18 points in the Knicks’ 107-103 win over the Portland Trail Blazers, but it was when he scored and how he scored that was noteworthy. First, he drove past Damian Lillard in the second quarter and converted an other-worldly reverse layup. Afterward, Rose talked about the importance of having his legs under him for the fourth-quarter shot. That rhythm was hard to regain after Rose tore the ACL in his right knee in 2012 and twice tore the meniscus in his right knee (2014, 2015). The injuries robbed Rose of nearly 60 percent of his games over a four-year period. They robbed him of his athleticism and his role as the face of the Bulls. Rose now has a fresh start in New York and, by all accounts, is fully healthy again. He has been mostly consistent in his first 14 games as a Knick -- one of the key reasons why New York (7-7) has been able to rebound from a slow start. And Rose also is dealing with different expectations in New York. Even after moments like Tuesday’s reverse layup or game-sealing jumper, teammates know not to anticipate that Rose will somehow morph into the player we all saw before his injuries. And Rose, a free agent this summer, seems just fine with that. His field goal attempts per game are a career low thus far (14.5) and he has said several times that he’s not looking to take the same shots in New York that he did in Chicago. He wants to make life easier for teammates like Anthony and Kristaps Porzingis, who had his second career 30-point game (31 points on 23 shots) on Tuesday. He's not looking to recreate past glory. "It’s a different stage [now]. I was reckless. I was young," Rose said of his Chicago days. "... Now I have a chance to re-establish myself here, and just take off from here."